Bournemouth manager Eddie Howe claims there is a 'conspiracy' among referees against striker Callum Wilson. He believes his side should have been given a second-half penalty for a foul on Wilson in their 2-2 Championship draw with Sheffield Wednesday. 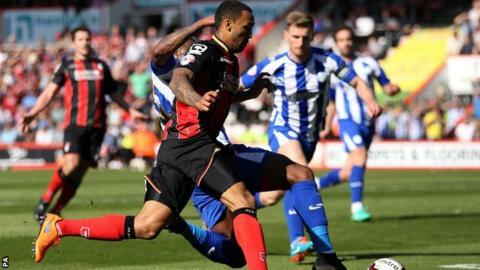 The result cost Bournemouth top spot, although two wins from their final two games will still seal promotion. "I just felt they've come together to talk about Callum and that's not right," Howe told BBC Radio Solent. "If it's a penalty, it's a penalty. It doesn't matter how many you get in the season." Howe also felt the challenge on 22-goal striker Wilson by Wednesday defender Lewis Buxton merited a red card. "It looks like the referees have come together to talk about Callum Wilson and said: 'Don't give him any penalties because Bournemouth have had too many this season and we don't want them to have any more'," he continued. "That's what it looks like because that is the most stonewall penalty you will see. It was nailed on. I had the perfect angle and I could see he was taken out. It was a red card and a penalty and that could ultimately have a big bearing on what happens at the end of the season." Howe did not apportion any blame to defender Adam Smith, who was distraught at the final whistle after conceding an injury-time penalty which allowed Wednesday to equalise. "The goal we conceded at the end is just one of those things that happens and I am not going to attach any blame to anybody," he added. "We've had so much success together and when you don't get the result you want you have to stand together with your players as well. "When you make a mistake and it costs your side points that is the natural reaction. The most important thing is to stand by him and tell him how much we love him." Van Gaal v Mourinho: The next great rivalry? Read more on Van Gaal v Mourinho: The next great rivalry? Who is England's best-ever bowler?